We offer more than soaps! 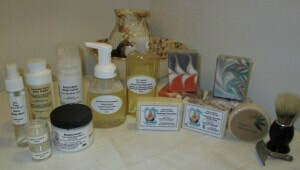 Check out our lotions, lip balms, essential oils, shampoos & hair conditioners and deodorants!!! All formulated to be SKIN FRIENDLY! Everyone in my family loves the moisturizing spray. anything close to the quality you make. Handcrafted right here in the good old U.S.A.
Feel free to mosey around our site and if you have any questions please give us a holler! Please note: Because we offer a wide variety of items it's impossible for us to always have each and every product in stock. If we are currently sold out of stock on an item you're looking for we'd be happy to move it to the top of our to-do list.